Malaysian Satay --- those little skewers of chicken, beef or mutton grilled over charcoals are a traditional Malay delicacy. 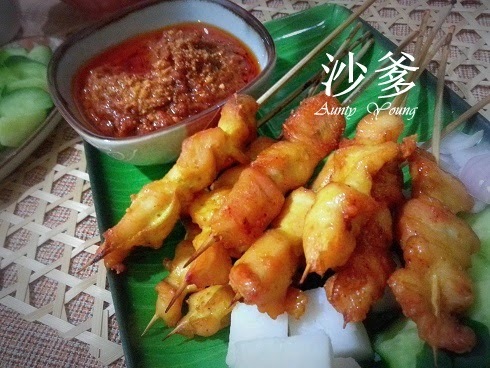 A common food in Malaysia, the Satay is best served with Satay Sauce and eaten with ketupat, cucumbers and onions. 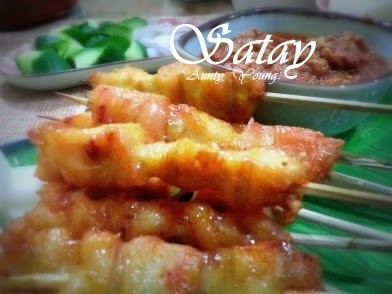 Having promised NaNak a barbeque party during the holidays, I've decided to add Satay to the list of barbeque food. Of course, to ensure I serve up my best Satay, I've decided to do a "warm up". 1. Mix all the marinade ingredients and add in the diced chicken. Refrigerate for up to 6 hours. 2. Preheat the oven to 200°C. Thread the diced chicken onto the skewers, place them on an oven rack and covered them in aluminium foil. Place a tray under the rack to allow the oil to drip. Grill for 20 minutes. 3. 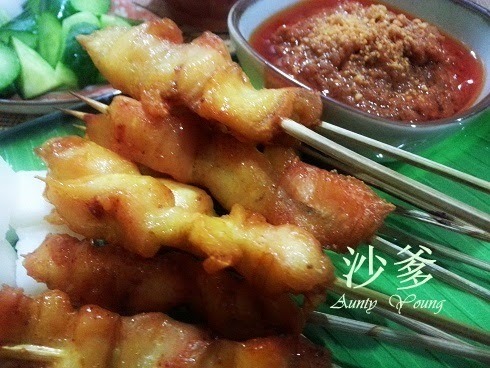 Remove the foil and brush both sides of the Satay with a lemongrass stick dipped in cooking oil. Grill another 10 minutes or until cooked. 4. Serve the grilled Satay with Satay Sauce and cucumber and onion slices. 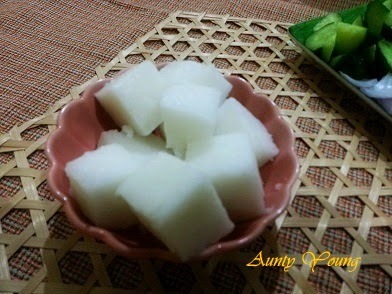 Instant ketupat; rinse, boil, dice and finally, serve the ketupat! Charcoal grilled Satays would taste better and become more aromatic, but for convenience's sake I used the oven for this batch. Hopefully, I can share the difference of charcoal grilled Satay and oven grilled Satay after the barbeque party. Wow...i am drooling over your satay...I have bookmarked this..
Hah......glad that you like it,then i wait for your turn. Yes, give me 5!! hah.........hah.........looks like we can read our mind each other even we are far away East and West. Look yummy! can open a stall selling satay, hehehe..